Valve closes when energized and opens when de-energized. When the coil is energized the plunger presses the poppet, closing the pilot orifice, and opens a bleed passageway to permit pressure to build above the piston and seal it. Upon de-energizing the coil, the pilot orifice is opened, relieving the pressure above the piston allowing it to leave its seat. 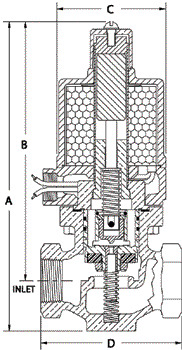 The bottom spring allows the valve to operate at zero pressure drop. To control the flow of Hot Liquids, Hot Gases, Cryogenics** and any other fluids not reactive with construction materials and free of sediment. Cryogenic fluids include Liquid Oxygen (-297°F), Liquid Argon (-303°F) and Liquid Nitrogen (-320°F). Valve operates from zero to maximum differential pressure indicated in table. Valve must be mounted in horizontal pipe with solenoid enclosure vertical and on top. For Steam Applications, go to the TYPE "SR" valve page.